….and the grass is a long time coming. We’re keeping the main herd in this sacrifice pasture and continuing to feed hay. Just because we miscalculated we can’t ask the cows to pay for our mistake! Not only isn’t there enough yet, but this early the grass is “washy”…not as nutrient rich. On the other hand, you can’t see it but there is a beautiful stand of clover coming along. We estimate in a few weeks we’ll be able to move the herd to begin our serious rotational grazing. 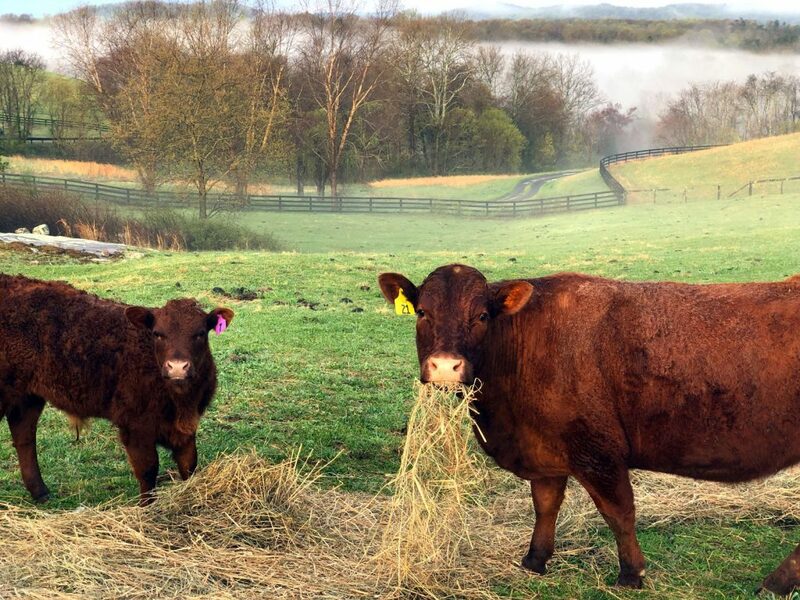 The steer calf in the picture is half English…the full English cow sharing the hay was calved at Thistle Hill and is out of the Tilbrook and Cutcombe herds in England.